This article is about the ethnic group that lives primarily in the Wa States area. For the archaic term for Japanese people, see Wajin (ancient people). The Wa States in an early 20th century The Imperial Gazetteer of India map. The Wa people (Wa language: Vāx; Burmese: ဝလူမျိုး [wa̰ lùmjóʊ]; Chinese: 佤族; pinyin: Wǎzú; Thai: ว้า) are an ethnic group that lives mainly in northern Myanmar, in the northern part of Shan State and the eastern part of Kachin State, near and along Burma's border with China, as well as in Yunnan, China. Historically the Wa have inhabited the Wa States, a territory that they have claimed as their ancestral land since time immemorial. It is a rugged mountainous area located between the Mekong and the Salween River, with the Nam Hka flowing across it. The Wa traditionally practiced subsistence agriculture by cultivating rice, peas, beans, poppies and walnuts. They bred water buffaloes, which they used mainly for sacrificial purposes. Generally, the traditional customs of the Wa, as well as their lifestyle, are very similar to those of the Naga people further to the Northwest. According to Sir George Scott in the Wa origin myths the first Wa originated from two female ancestors Ya Htawm and Ya Htai who spent their early phase as tadpoles (rairoh) in a small lake known as Nawng Hkaeo. The lake is located in the northeastern Wa territory in the border area between China and Myanmar. Very little is known about the early history of the Wa. What is known is mostly made up of local legends telling that in the distant past the historical Wa States and all the territories of eastern Shan State, as well as large swathes of the adjacent areas of present-day China had belonged to the Wa. In the area of the former Kengtung State the Wa were displaced around 1229 and were later defeated by King Mangrai. At the time of British rule in Burma the Shan were the majority in Kengtung state, with other groups such as Akha and Lahu forming sizable communities. The Wa now form a minority of only about 10% in Kengtung District despite having been the original inhabitants. The Wa originally had animist religious beliefs centered around ritual blood sacrifices. Villages had a spirit healer (Tax Cao Chai) and the traditional way of dealing with sickness or other problems was to sacrifice a chicken, a pig or a larger animal, depending from the magnitude of the affliction. According to local legend, the practice of cutting a human head was intended as a ritual sacrifice in order to improve the fertility of the rice fields. Traditional villages had also shrines (Nyiex Moeg) where a buffalo was sacrificed once every year at a special Y-shaped post named Khaox Si Gang with an offering of the blood, meat and skin performed at it. Animals were also sacrificed at celebrations such as marriages and funerary rituals among the traditional spirit-worshiping Wa, a practice that still endures among the Christian Wa. However, the Wa that were under Buddhist influence developed different traditions. In the traditional Wa society monogamous marriage was the norm and there was sexual freedom for both men and women before marriage. The chewing of betel with areca nut was formerly also an important custom. The Wa have different kinds of traditional dances. One important dance in their culture is accompanied by the beating of a large hollow wooden drum. This way of dancing, among other Wa dances such as the hair dance and festivals, is being promoted as a tourist attraction by the Yunnan tourism authorities in China. The Wa people also have a well-engrained drinking culture, with large amounts of local moonshine being produced and are widely believed to on average consume the largest amount of alcohol in China. The Wa language forms a language group belonging to the Palaungic branch of the Austroasiatic language family. It formerly had no script and the few Wa that were literate used Chinese characters, while others used the Shan language and its script. Christian missionary work among the Wa began at the beginning of the 20th century first in the Burmese and later in the Chinese areas of the Wa territory. It was led by William Marcus Young of Nebraska. The first transcription of the Wa language was devised by Young and Sara Yaw Shu Chin in 1931 with the purpose of translating the Bible. This first Wa alphabet was based on the Latin script and the first publication was a compilation of Wa hymns in 1933, the Wa New Testament being completed in 1938. This transcription, known as "Bible orthography" is known as lǎowǎwén, 老佤文 "old Wa orthography" in Chinese, and is now used mainly in the Burmese Wa areas and among the Wa in Thailand. A revised Bible orthography has been adopted as "official Wa spelling" by the authorities of the Wa Self-Administered Division in Pangkham, which have published a series of primers in order to improve the literacy of the United Wa State Army troops. Also, after 2000 Wa people in social networks such as Facebook and other online media, as well as Wa songwriters in karaoke lyrics of Wa songs use this Myanmar (revised Bible) "official Wa orthography" in its main variations. In China, a transcription adapted to the new pinyin romanization, known as "PRC orthography" or "China official orthography", was developed for the Wa people in 1956. However, its publications, mainly propagated through the Yunnan administration, are yet to reach a wider public beyond academics. This new Wa alphabet is treated as the first formal script of the Wa. The Western Lawa are officially considered part of the Wa minority in China and are also known as 'tame Wa'. Wa headmen in British Burma. Very little has been written about the Wa people except in the Chinese language. The area where they live had been traditionally administered by a Saopha, a Shan hereditary chief. 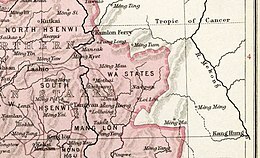 In the second half of the 19th century, the British authorities in Burma judged the Wa territory remote and of difficult access. Thus, excepting Mang Lon where the Saopha resided, the British left the Wa State without administration, its border with China undefined. That situation suited the Wa well, for throughout their history they had consistently preferred being left alone. The Wa were largely portrayed by colonial administrators as wild and dirty people owing to their practice of headhunting. However, Chinese documents written prior to the twentieth century rarely mentioned the Wa as headhunters and yet it is this aspect of Wa culture that has been cited more than any other in order to emphasize the primitiveness of the Wa. The prejudice continues in modern times when the Wa, who are economically not that different from other ethnic hill tribes in the area such as the Lahu people, are largely known for their rebel army and as being involved in drug trafficking, overshadowing other aspects of their culture. The international border that had been defined between Burma and China made that the Wa people were divided between the two countries. The Wa regions in Burma were largely left alone until the 1950s, when remnants of Chiang Kai-shek's National Revolutionary Army fled the 1949 communist revolution in China. A decade and a half later, the region was under the influence of the Communist Party of Burma, which was very active in the area. During that time opium cultivation and sales grew and the ancient traditional life became disrupted, but also an administrative system that collected revenue and maintained a significant armed force, as well as a rudimentary infrastructure, ushered the Wa region into the modern era. In 1989 the Wa authorities expelled the Burma Communist Party and negotiated a cease-fire with the then leader of Burma's military junta Khin Nyunt. They founded the United Wa State Army and United Wa State Party with a centralized command. In return for agreeing to the ban of poppy cultivation and opium production the region experienced a massive influx of international development aid. The Wa Special Region 2 was created within the northeastern Shan State, with its de facto capital in Pangkham. The United Wa State Army was one of the world's largest narco-armies, with up to 10,000 men under arms. Until 1996 the UWSA was involved in a conflict against the Mong Tai Army which suited the objectives of the Tatmadaw in the area. During this conflict the Wa army occupied areas close to the Thai border, ending up with the control of two separate swathes of territory north and south of Kengtung. In 1999 when the Burmese military requested the Wa fighters to return to the northern area the UWSA refused. During the 1990s the areas controlled by the UWSA were involved in heroin production. During the 2000s, the United Wa State Army shifted focus into amphetamine production. Records of official seizures compiled by the United Nations suggest that in 2006 Myanmar was the source of half of Asia's methamphetamine, known in Thailand as yaba, and some experts believe that most drug labs are in areas under Wa control. A map of Burma showing the Wa Self-Administered Division, coloured brown. The land where the Wa have been traditionally living is divided between Burma and China. The international border cuts the ancestral Wa region roughly in half. The Wa are one of the 56 ethnic groups officially recognized by China. In China, the Wa live in compact communities in the Ximeng Va Autonomous County (in Wa: Mēng Ka or Si Moung), Cangyuan Va Autonomous County, Menglian Dai, Lahu and Va Autonomous County (Gaeng Līam), Gengma Dai and Va Autonomous County (Gaeng Mīex or Gaeng Māx), Lincang (Mēng Lām), Shuangjiang Lahu, Va, Blang and Dai Autonomous County (Si Nblāeng or Mēng Mēng), Zhenkang County, and Yongde County in southwestern Yunnan. Their population in China is estimated at around 400,000. Menggong Township 勐汞佤族乡 (recently incorporated into Dedang Township 德党镇), Yongde County: in Menggong 勐汞、Daba 大坝、Songlin 松林、Dapingzhang 大平掌、Hunai 户乃、Xiaodifang 小地方、Lielie 列列. There are 10,289 Benren in the township as of 2010. The Wa are one of the 135 officially recognized ethnic groups of Myanmar. Their proportion to Myanmar's total population is 0.16. Although little is known about the ancient history of the Wa, they are acknowledged by other dominant ethnic groups in Shan State, such as the Tai Yai, to be the original inhabitants of the area. In Burma, the Wa live mostly in small villages near Kengtung and north and northeastwards close to the Chinese border, as well as a small area east of Tachileik. The Wa Special Region 2 of the Northern Shan State or Wa State was formed by the United Wa State Army (UWSA) and the remains of the former Burmese Communist Party rebel group that collapsed in 1989. The Wa State and the UWSA are in a fragile cease-fire agreement with the Burmese military government. They have been accused by Western governments of involvement in drug trafficking but have banned opium production since 2005 and have received United Nations aid in improving legitimate agriculture. As stipulated by the 2008 Burmese Constitution, on 20 August 2010 the Wa Self-Administered Division has been established. It is set to be administered by the Wa people and its territory is between the gorges of the Mekong and Salween, in the east part of the Shan State, near the border with the Chinese province of Yunnan. In recent times some Wa communities from Burma have crossed the border and settled in Thailand, where they have no official status as a Hill Tribe. The Wa live mainly in the Mae Sai District and Mae Yao subdistrict of Chiang Rai Province, as well as in Wiang Pa Pao District in southern Chiang Rai Province and Chiang Dao District in Chiang Mai Province. In Thailand the Wa having come recently from Burma are often referred to as 'Lawa', although they do not strictly belong to the latter ethnic subgroup. Harvey, G. E. Wa Précis. Rangoon, 1933. Lintner, Bertil. Burma in Revolt: Opium and Insurgency Since 1948. Chiang Mai, 1999. Marshall, Andrew. The Trouser People: a Story of Burma in the Shadow of the Empire. London: Penguin; Washington: Counterpoint, 2002. ISBN 1-58243-120-5. Mitton, Geraldine Scott of the Shan Hills. London: John Murray, 1936. Scott, J. G. Burma and Beyond. London, 1932. Scott, J. G. Gazetteer of Upper Burma and the Shan States. 5 vols. Rangoon, 1900-1901. Winnington, Alan. The Slaves of the Cool Mountains. Berlin: Seven Seas, 1959. Winnington, Alan. The Slaves of the Cool Mountains: The Ancient Social Conditions and Changes Now in Progress on the Remote South-Western Borders of China. London: Lawrence & Wishart, 1959. Fiskesjö, Magnus. "Introduction to Wa Studies." Journal of Burma Studies 17.1 (2013), 1-27. Fiskesjö, Magnus. "The autonomy of naming: Kinship, power and ethnonymy in the Wa lands of the Southeast Asia-China frontiers." In Charles Macdonald & Yangwen Zheng, eds. Personal Names in Asia: History, Culture and Identity. Singapore: Singapore University Press, 2009, pp 150–74. ISBN 9971-69-380-1. Fiskesjö, Magnus. "Slavery as the commodification of people: Wa 'slaves' and their Chinese 'sisters'." Focaal-Journal of Global and Historical Anthropology 59 (Spring 2011), 3-18. Fiskesjö, Magnus. "Mining, history, and the anti-state Wa: The politics of autonomy between Burma and China." Journal of Global History 5.2 (June 2010), 241-64. Fiskesjö, Magnus. "Participant intoxication and self-other dynamics in the Wa context." The Asia Pacific Journal of Anthropology 11.2 (June 2010), 111-27. Takano, Hideyuki. "The Shore Beyond Good and Evil: A Report from Inside Burma's Opium Kingdom." Tokyo: Kotan Publishing, 2002. In English. Kramer, Tom. "The United Wa State Party: Narco-army or ethnic nationalist party?" Washington, DC: East-West Center Washington; Singapore: Institute of Southeast Asian Studies, 2007. Scott, J. G., and Mitton, Geraldine. In the Grip of the Wild Wa. London, 1913. Winnington, Alan. "Kopfjäger" [ins Deutsche übertragen von K. Heinz]. Berlin: Verlag Volk und Welt, 1983. Series: Roman-Zeitung; Heft 398. [German translation of the novel "Headhunters"]. ^ a b c d "Headhunting days are over for Myanmar's "Wild Wa"", Reuters, Sep 10, 2007. ^ Grawng klieh yam lih khaing sigien rang, sigang lih dix. ^ Krax moh aux daux ju pa hoik luan mai pa simie sivoe ngai. ^ a b Chouvy, Pierre-Arnaud & Meissonnier, Joël. "Yaa Baa. Production, traffic, and consumption of methamphetamine in Mainland Southeast Asia". Singapore University Press, 2004. Retrieved 2006-03-13. ^ a b Davis, Anthony (19 November 2004). "Thai drugs smuggling networks reform". Jane's Information Group. Archived from the original on March 8, 2005. Retrieved 2009-03-05. ^ Zhao Mingsheng, Gao Honghui [赵明生, 高宏慧]. 2012. 佤族支系“本人(佤)”的产生及其特征. ^ "တိုင်းခုနစ်တိုင်းကို တိုင်းဒေသကြီးများအဖြစ် လည်းကောင်း၊ ကိုယ်ပိုင်အုပ်ချုပ်ခွင့်ရ တိုင်းနှင့် ကိုယ်ပိုင်အုပ်ချုပ်ခွင့်ရ ဒေသများ ရုံးစိုက်ရာ မြို့များကို လည်းကောင်း ပြည်ထောင်စုနယ်မြေတွင် ခရိုင်နှင့်မြို့နယ်များကို လည်းကောင်း သတ်မှတ်ကြေညာ". Weekly Eleven News (in Burmese). 2010-08-20. Retrieved 2010-08-23. 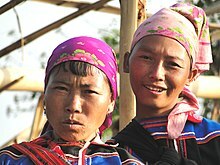 The Shan are a Tai ethnic group of Southeast Asia. The Shan live primarily in the Shan State of Burma (Myanmar), but also inhabit parts of Mandalay Region, Kachin State, and Kayin State, and in adjacent regions of China, Laos, Assam and Thailand. Though no reliable census has been taken in Burma since 1935, the Shan are estimated to number 4–6 million, with CIA Factbook giving an estimate of five million spread throughout Myanmar. Shan State is a state of Myanmar. Shan State borders China to the north, Laos to the east, and Thailand to the south, and five administrative divisions of Burma in the west. Largest of the 14 administrative divisions by land area, Shan State covers 155,800 km², almost a quarter of the total area of Burma. The state gets its name from the Shan people, one of several ethnic groups that inhabit the area. Shan State is largely rural, with only three cities of significant size: Lashio, Kengtung, and the capital, Taunggyi. Taunggyi is 150.7 km north east of the nation's capital Naypyitaw. Wa State is an unrecognised State of Myanmar (Burma) that is currently subsumed under the official Wa Special Region 2 of northern Shan State. The administrative capital is Pangkham. The name Wa derives from the Wa ethnic group, who speak a language in the Austroasiatic family of languages. The United Wa State Army, also abbreviated as the UWS Army, is the military wing of the United Wa State Party (UWSP), the de facto ruling party of Wa State. It is an ethnic minority army of an estimated 20,000–25,000 Wa soldiers, led by Bao Youxiang (鲍有祥). The UWSA was formed after the collapse of the armed wing of the Communist Party of Burma (CPB) in 1989. Kengtung is a town in Shan State, Myanmar. It is the principal town of Kengtung Township. Kengtung is located on the National Highway 4 (NH4) and at the AH2 and AH3 of the Asian Highway. Lancang Lahu Autonomous County is an autonomous county under the jurisdiction of Pu'er City, in southwestern Yunnan province, China. Lancang is the same as Lan Xang, and refers to the Mekong River on its eastern borders and adopted by modern Laos, a Tai word meaning Million Elephants. Mong Ton Township or Mong Tong Township is a township of Mongsat District in the Eastern Shan State of Myanmar. The capital town is Mong Ton. It borders Mong Pying Township to the north, Mong Hsat Township to the east, Mong Nai Township and Mong Pan Township to the west and Thailand to the south. Loi Hkilek mountain is located in the area.It have two townships.They are Pone Par Khem, and Mong Hta. At Mong Ton township, live in Shan,Lahu,Lisu,Wa,Burma, and Chinese. Shuangjiang Lahu, Va, Blang and Dai Autonomous County is a county in the southwest of Yunnan province, China. It is under the administration of the prefecture-level city of Lincang. Ximeng Va Autonomous County is an autonomous county under the jurisdiction of Pu'er City, in the southwest of Yunnan Province, China, bordering Myanmar's Shan State to the west. Wa/Va people, who speak the Wa language, are the main inhabitants in Ximeng County. The Mong Tai Army, was an insurgent group consisting of soldiers from the Shan minority in Myanmar, founded in 1985 by Khun Sa. It had up to 20,000 armed troops at its peak, and was one of the largest forces opposing the government of Myanmar at its time. It was also involved in drug trafficking in Southeast Asia. Saharat Thai Doem was an administrative division of Thailand. 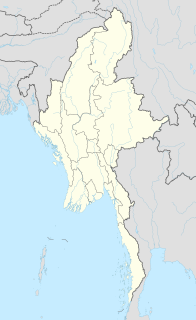 It encompassed the parts of Shan State of British Burma annexed by the Thai government after the Japanese invasion of Burma. Panlong Subtownship is a subtownship of the Wa Self-Administered Division of Shan State, formerly and conterminously part of Hopang District. Kengtung, known as Menggen Prefecture or Möng Khün Chiefdom or Mueng Khuen Fu from 1405 to 1895, was a Shan state in what is today Burma. The capital and the residence of the ruler was Kengtung in the centre of the state. It was the only urban area in this mountainous state whose landscape is dominated by the Daen Lao Range. The Wa States was the name formerly given to the Wa Land, the natural and historical region inhabited mainly by the Wa people, an ethnic group speaking an Austroasiatic language. The region is located to the northeast of the Shan States of British Burma, in the area of present-day Shan State of northern Burma (Myanmar) and the western zone of Pu'er Prefecture, Yunnan, China. The Kuomintang in Burma (KMT) were Chinese Nationalist troops that fled to the Burmese border region in 1950 after their defeat to the Communists in the Chinese Civil War. Technically termed the Yunnan Anti-communist National Salvation Army, the KMT was commanded by General Li Mi. It made several unsuccessful invasions into Yunnan Province in the early 1950s, only to be pushed back into Burma each time by forces of the Chinese Communist Party's People's Liberation Army. Mong Lem or Mönglem was a Shan state in of what is today the Menglian Dai-Lahu-Va Autonomous County of the Pu'er Prefecture, Yunnan region, China.